As Shell Lumber & Hardware celebrates its 90th Anniversary, it is undergoing a re-birth in so many ways. The new store front sign on 27th avenue signals the beginning of a new age for the World's #1 Home Improvement Store. 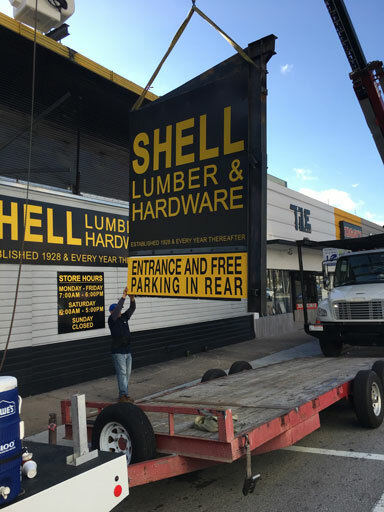 Shell's Landmark Sign Comes Down on 27th Avenue. It's removal marks the beginning of a new face lift for the 90 year old store. Over the last several months, Shell Lumber & Hardware has been undergoing a dramatic transformation. While embracing our past, we are building for the future. Here are just a few of the items we are working on. Guaranteed Low Prices - Volume purchases and special buys have allowed us to reduce prices on thousands of items store wide. Come on in and see prices competitive to the Big Box stores across all Lumber, Building Supplies, Hardware, and Paint; all with Shell's high standards of quality and service. Shell Signature Collection Paints - Shell has just introduced the first paint made in Florida, for Florida! Finally, a paint that can withstand the special demands of the Florida climate. Shell's Interior Paints are formulated to be beautiful, tough, and lasting. Our Exterior Paints will stand the test of driving rain, humidity, sun exposure and still maintain its beautiful finish. Read all about them here. Unmatched Paint Color Matching - Investing in the latest technology, we are now able to match any existing color with unsurpassed accuracy. Our new scanning technology can even provide colors that go with any item you choose! We can scan any decorative item you can bring into the store - rug samples, porcelain, pieces of furniture - anything that represents the color range you want. Our system will scan it and provide you with paint colors that match. Open for Business 24/7 - For added convenience customers may now order at www.ShellLumber.com any time day or night. You can place orders for Free In-Store Pick-Up and pick up at your convenience. Or, you may shop from over 100 thousand items for delivery via UPS/Fedex anywhere in the United States. Your choice, simply choose "Order For In-Store Pick Up" or "Order for Delivery"
New Moulding Showroom - We know that Moulding is one of the most important home improvement decisions anyone can make. That's why we stay on the leading edge of designs and selection. Our moulding showroom contains a vast selection of Crown, Base, and Casings to match existing installations as well as make contemporary creations. Door Hanging Machine - We have invested in the newest technology that allows us to hang any door in record time. Located at our distribution facility, the new automated, computer controlled system will hang a door in a matter of minutes with total accuracy. Just make your selection from any stock door and it can be ready to hang in record time! Shell's newly re-designed Moulding showroom is designed to beautifully represent all possible applications for the largest selection of moulding in South Florida. We have more exciting services and products coming in 2018. So come on in and check us out. The popcorn is still fresh and free and Snow Cones are still free on Saturdays! Our store is located at 2733 SW 27th Ave, Coconut Grove, FL 33133. Our phone number is (305) 856-6401. Shell Lumber & Hardware - Established in 1928, and every year thereafter..